With volatility spikes forever lurking in this algo-driven market, proper stock selection has never been more important. "In an environment of more normalized and lower equity market returns, stock-picking will be ever more important," reminds HSBC's global equity strategy team. "The surge in equity volatility is also supportive from this perspective as it should provide greater opportunities for potential market dislocation and mispricing." Here's how HSBC is thinking about positioning their clients right now, as seen in a new 52-page research report obtained by TheStreet. Unlike well-known stock strategist and bull Jim Paulsen at The Leuthold Group, HSBC prefers a bit more caution. Says HSBC: "We are moderately positive on global equities. Weak performance in the first quarter, coupled with strong upward earnings revisions on the back of US tax reform, have brought valuations down to less demanding levels. And these valuations remain supported by low bond yields, with our Fixed Income team forecasting that the US 10-year yield has peaked and will fall back towards 2.3% by the end of the year. Indeed, cyclicals appear particularly vulnerable to a deceleration in growth at present. They have outperformed significantly since the start of the synchronized global upswing in mid-2016, and this has left valuations looking stretched. We also detect a high degree of investor optimism towards the cyclical space relative to defensives and this suggests that there is scope for disappointment." 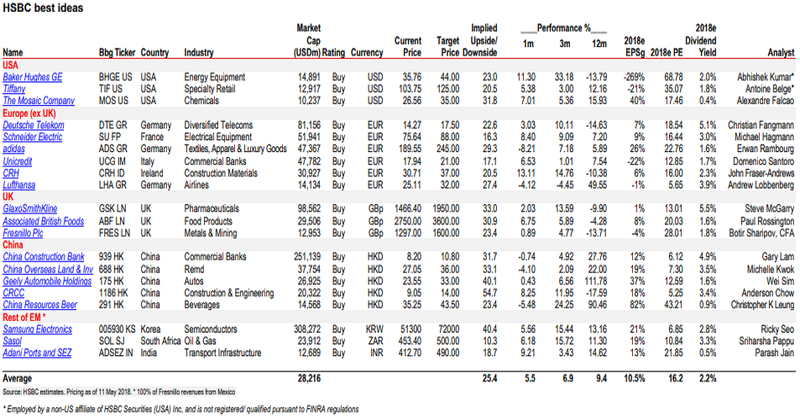 HSBC's top stocks list is mostly dominated by large-cap plays that happen to pay attractive dividend yields. More importantly, the stocks already have a decent amount of momentum behind them: the average one-month performance is +5.5%. China Overseas Land & Inv.